BACKGROUND: Gastrectomy with extraperigastric (D2) lymphnode dissection for advanced gastric cancer have been performed and recommended as the standard operation in Korea and Japan. Although laparoscopy gastrectomy is considered one of the minimally invasive surgeries, widespread use of this technique is limited because of the some technical difficulties. Robotic surgery was adopted to improve some technical disadvantage with laparoscopic surgery. Although there have been several reports of robotic gastrectomy, there is no reports to assess the surgical outcomes of robotic gastrectomy with D2 lymphnode dissection for advanced gastric cancer compared with those of laparoscopic gastrectomy. Objectives: This retrospective study aimed to evaluate perioperative outcome of robotic gastrectomy with D2 lymph node dissection for advanced gastric cancer (RG) compared with laparoscopic gastrectomy with D2 lymph node dissection for advanced gastric cancer (LG). Methods: Between July 2005 and Apr 2009, robotic and laparoscopic gastrectomy with D2 lymphnode dissection for advanced gastric cancer without combined operation was included as entry criteria. Within this period, 33 RG using the da Vinci Surgical System and 46 LG were consecutively performed in Yonsei University Severance Hospital, Seoul, Korea. All operation was performed by one surgeon. We evaluated clinicopathologic and surgical characteristics, operative outcomes, and postoperative morbidities and mortalities between the RG group and the LG group from a prospectively designed computer database. As statistical analysis, Chi-square and independent t-tests were used to compare those two groups. P value less than 0.05 were considered significant. RESULTS: Although the mean age and proportion of co morbid patients were lower in the RG group than the LG group (55.3±13.2 years versus 61.8±11.8 years; p=0.025 and 30.3% versus 54.3%, p=0.128), age, BMI, tumor size, and pathological stage was similar with two groups. Although operating time of the RG group was significantly longer than the LG group (231.8±42.1 minute versus 156.5±45.0 minute, p<0.001), blood loss of the RG group was marginally smaller than the LG group (74.2±71.2 ml versus 169.2±258.0 ml, p=0.261). The numbers of retrieved lymphnodes were similar with two groups. The morbidity rates of the RG group was marginally smaller than the LG group (15.2% versus 21.7%, p=0.462).There was no conversion to open surgery in two groups. The mean post hospital stay (without patients who were occurred postoperative complication) was marginally smaller than the LG group (5.7±1.4 days versus 6.6±3.6 days). There was one mortality patients in RG group. Regarding the level of serum C-reactive protein of the third postoperative days and those of peak levels (without patients who were occurred postoperative complication), the RG group was significantly lower than the LG group (68.7±41.0 versus 102.3±67.1; p=0.048 and 77.9±42.6 versus 112.2±67.2; p=0.032). 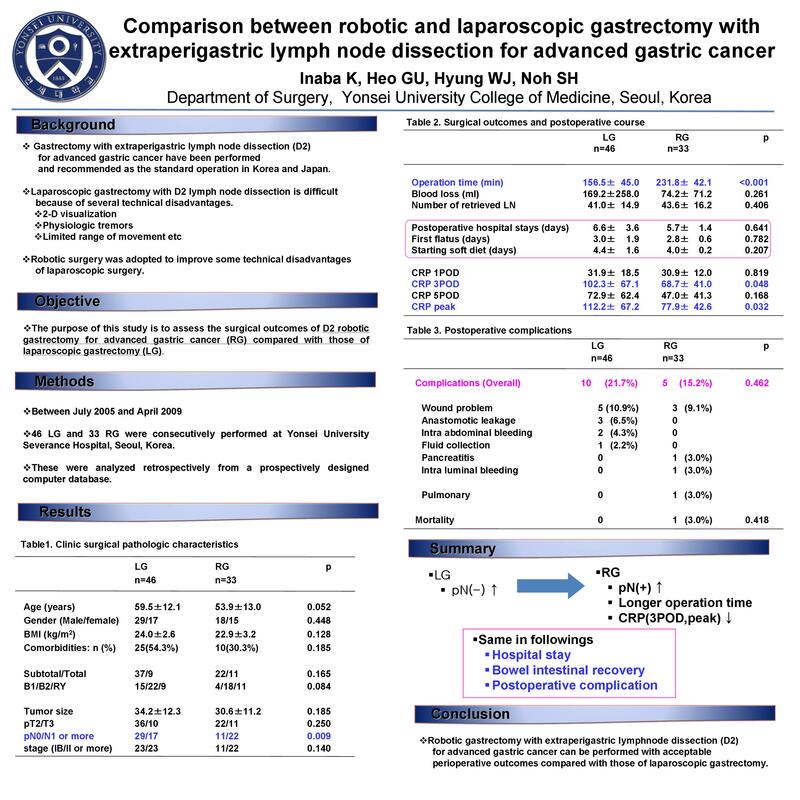 Conclusion: This study suggests that robotic gastrectomy with D2 lymphnodes dissection for gastric cancer can be performed with acceptable perioperative outcomes compared with laparoscopic gastrectomy with D2 lymphnodes dissection for gastric cancer.